Chances are, if you’re into cycling, you’re not anti-French. I think most of us would consider having French riders finishing second and third in the Tour to be ‘a good thing’. Okay, you’d probably prefer someone from your own country to be standing somewhere on the podium, but failing that, it doesn’t do any harm for the race to get a bit of a boost in its homeland. Cycling from Calais to the Mediterranean earlier in the year, I was struck by how few cyclists there were in France and how seemingly 99 per cent of them were men over the age of 50. Granted, the 37-year-old Jean-Christophe Péraud might not be a million miles from there, but Thibaut Pinot is just 24. And what was the alternative anyway? It was Alejandro Valverde. Nairo Quintana will surely be leading the Movistar team at the Tour next year, so this was probably his last chance to get a top-three place. I always try and give Valverde the benefit of the doubt, because as a non-Spanish speaker I presumably miss many the nuances of his interviews, but it’s fair to say he isn’t the most popular rider. He’s served a ban for doping, but doesn’t really seem at all apologetic about it. Whether that’s true or not, personally I was pleased to see Pinot hang on for third. Pinot was always the most vulnerable one and even having to stop for a bike change, Péraud managed to wrest second place off him. However, the younger man actually put in a pretty strong time trial and even gained time on Valverde, who’s basically looked increasingly spent this last week or so. He’s still always worth beating though. Chapeau to the Frenchies. 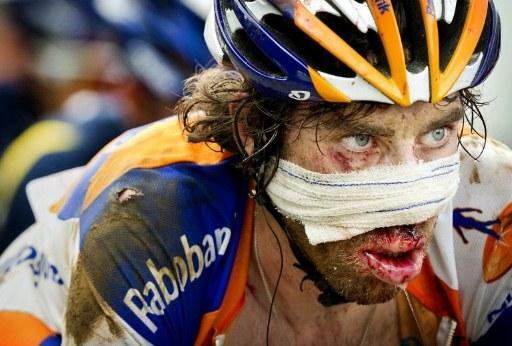 Looking disgusting on the bike is Laurens Ten Dam’s thing. I think he takes pride in it. A Dutch artist did a painting of that hideous photo and Laurens now has it on his living room wall. Time trials are where he particularly excels. The prolonged, hard, mouth-open effort tends to leave fluids leaking from every facial orifice and they do this for an hour, collecting and congealing on skin and facial hair. What Laurens is not so good at, however, is racing on a time trial bike. He came 55th on the day which meant he slipped below Haimar Zubeldia and also King Leopold, who put in a very strong ride to gain a few places on the general classification. Laurens only dropped one place, however, because his team-mate, Bauke Mollema, had just about the worst time trial imaginable, finishing 140th. Here’s the general classification top ten. Dicking about, dawdling along, drinking Champagne and then belting up and down the Champs Elysées a few times before a sprint finish. If the green jersey already has a ‘Sagan’ name tag in it, this is a stage which is worth plenty in its own right for the sprinters.